Kellie Hultgren later organized the Narbonicons, which started in 2003. 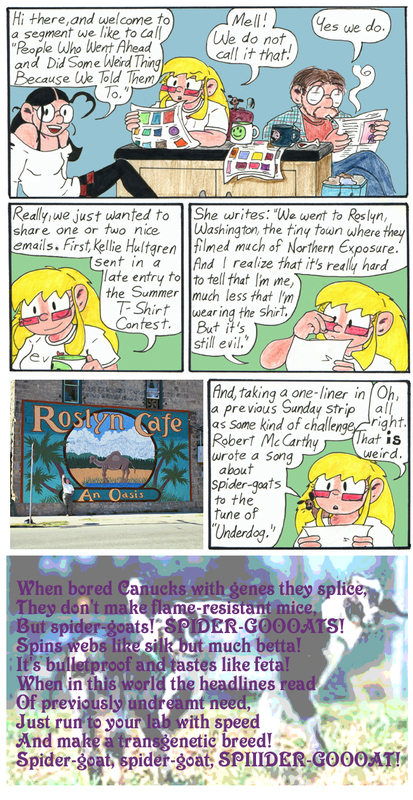 Rob McCarthy is a friend and Viz coworker as well as the creator of the comic Hell on Wheels. His spider-goat song still cracks me up. All spider-goat songs should mention feta cheese, one of the funniest cheeses. Andrew’s in the newspaper in the first panel. I never pass up an opportunity to draw Andrew. Also notice a rare appearance of the three-eyed smiley mug and the radiation symbol mug in the same panel! You don’t get that kind of excitement in your average Sunday comic, boy howdy no. Oh, and there are gerbil tails hanging out of the wastebasket, always one of my favorite grim details to draw into a strip. That’s a nice, relaxed splash panel. But what design is on that other mug? That’s a trefoil, aka the radiation symbol. You can barely see any of it, though. Huh. Didn’t realize the three-eyed smiley was green. They’re usually yellow, unless they undergo secondary mutation.